Summer was always a lot of fun for us growing up, and it still is today. School’s out, the weather’s great, and opportunities abound for lots of outdoor activities: a trip to the pool or beach, going camping or hiking, or simply enjoying a summer picnic! Get your summer off to a great start with some great books that capture the essence of the season. Our suggestions of books, both new and old, will hopefully make you want to explore and enjoy summer all the more. Created by the American Museum of Natural History, this board book contains 26 animals from the sea. Beautiful color photographs illustrate each letter. Brief facts are included as well. Cordelia and her troop of dino-scouts enjoy a camping trip in the great outdoors. This book features the same characters from Idle’s Tea Rex. In this tenth book in the Pony Scouts series, friends Meg, Jill, and Annie are spending summer vacation with their ponies, and it is Meg’s first time camping. A great choice for early readers. This is the second collaboration between author and illustrator in which they pair a season with an early learning concept, in this case counting. Their earlier work was entitled Pick a Circle, Gather Squares: A Fall Harvest of Shapes. The collage illustrations capture both the seasonal and counting concepts. In this latest Duck & Goose escapade, the tenth to be exact, they trek to the beach where they have yet another adventure that cements their friendship. This cartoonish style book makes for a very silly read. Flip and Fin, the sand shark twins who live at the bottom of the sea, prepare for joke day at school. It’s filled with many child-friendly jokes. A few nonfiction notes about sea creatures are included as well. This book provides numbered step-by-step instructions and clear visuals that make drawing simple and rewarding for younger children. The use of simple shapes will help children create sea life, from flying fish to sharks. On the last day of vacation, Mia finds a pair of flippers that she thinks is a mermaid’s shoes. She takes them home and wears them everywhere in search of the sea. She finally ends up atop the fountain in the public square. This genuinely sweet story was first published in the Netherlands. The double-spread illustrations are dreamlike and employ varied perspectives. In this latest adventure, Millie plans a backyard camping trip for herself and a few friends. The expressive watercolor artwork is a perfect match to the humor of the text. In this compassionate, wordless story, a young boy and girl help to save an octopus that has washed up on shore. The illustrations are done in oil with crackle varnish and are typical of Alison’s style. Boy and Girl set out to have a picnic lunch and meet several animals along the way. As they search for the perfect spot, each of the animals loses something. Burningham, in his illustrations, “hides” each item and encourages the reader to find it. The interactive aspect is sure to make this a fun read. 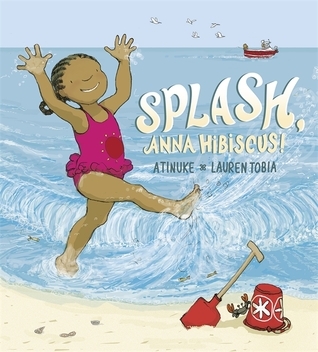 This book uses a variety of poetic forms to celebrate the beach and seashore. Join Fancy Nancy and friends, as they discover that the beach is full of spectacular surprises! This latest book in the Sounds of the Wild series includes pop-up panoramas of some of the world’s most exciting shores. Children can also hear the sounds of nature and wildlife that accompany the seashore. In this very entertaining read-aloud, the Simple family examines the word “picnic” and in doing so creates a funny family story full of mayhem. The cut-paper–collage artwork is childlike and colorful. Anna Hibiscus lives in Africa. In this latest book, she is at the beach with her family. She tries, unsuccessfully, to get everyone into the water. It’s not until her family sees how much fun she’s having that they finally join her. This is a basic informational book suitable for beginning readers. Glossary words in the text appear in colorful fonts. Beautiful color photographs accompany the sparse text. This is the latest in the Super Simple Nature Crafts series. Nine projects are included in this volume. Color photographs enhance the step-by-step directions. In this sequel to Muncha! Muncha! Muncha!, the pesky trio of bunnies is back, intent on ruining Mr. McGreely’s peaceful day at the beach. But in the end, the bunnies save the day by helping him win the sandcastle building contest. The illustrations give each character distinct personality. A young girl’s active imagination turns a camping trip with her father into a wild adventure. The text has been translated from Swedish, and the illustrations are done in pencil and watercolor.